Monetarists are an innocent lot. American bloggers, op-ed writers, and economists seem quite taken in by Japanese Prime Minister Shinzo Abe’s promise of a grand monetary experiment. Abe is threatening to revoke the Bank of Japan’s independence, forcing those recalcitrant hard-money-loving inflation hawks to set a hard target of 2% inflation or higher. To an American monetarist, this is really Christmas. Finally, we get to actually test the hypothesis that a central bank can hit an inflation target if it really puts its mind to it! Finally, we get to see the ultimate two-men-enter, one-man-leaves doomsday showdown between the immovable object of Japan’s implacable deflation and the irresistible force of Print Money And Buy Stuff! But it is not to be. Shinzo Abe is not the Jesus of monetary policy. American monetarists, I feel for you – I would love to see the idea of monetary policy dominance put to a stark test – but I just don’t think it’s going to happen. It would be interesting to know which monetarists Noah is talking about. (The only “innocent” monetarist Noah links to is Matt Yglesias, who is neither innocent nor a monetarist.) Like Noah, I’ve been skeptical of the intentions of the Abe government, noting that bond yields don’t show much sign of inflation expectations. On the other hand the yen has weakened, so there’s likely to be at least a modest change in policy. But I put faith in markets, not politicians. You see, unlike most Americans who weren’t watching back in 2006-2007, I remember Shinzo Abe’s first term as PM. Unlike most Americans, so do I. And my hunch is that lots of bloggers have been following Japanese politics since before Noah was born. PS. We already know that central banks can hit 2% inflation targets, they’ve been (approximately) doing that for decades. PPS. And we already know there is no such thing as liquidity “traps,” the yen wouldn’t have depreciated on Abe’s comments if there were. This entry was posted on December 29th, 2012 and is filed under Misc., Monetary Policy. You can follow any responses to this entry through the RSS 2.0 feed. You can leave a response or Trackback from your own site. Noah’s 100% reliance on Abe’s politicalness as the rightful analysis is teh awesome. Scott’s most fun like this. Those MMs who are calling for Japan to go into inflationary mode, are really asking for Japan to blow up. They don’t seem to recognize what happens when debt reaches 20, 25 times the government tax revenue. When that happens, a non-linearity arises between revenues and expenses. Most academics and central bankers believe that when a country gets to a point where there is a seeming choice to either inflate or default, they are allegedly choosing between two mutually exclusive options. What is more likely however is that one causes the other. If with that much debt a central bank tries to inflate its way out of the problem, and this moves the swaps curves or debt costs, then expenses grow exponentially while revenues grow linearly. So for Japan, which has around 25 times the debt to government revenue, if they should ever go insane and take the advice of MMs, and go into inflationary mode, and the swaps curves move 200 or 300 bps, then they will end up owing more in interest than they take in as tax revenues. They’ll be toast. But I put faith in markets, not politicians. Not true. When it comes to spending (relative and aggregate), prices (relative and aggregate), and interest rates, that is, when it comes to money production, you put your faith in governmental technocrats, not markets. This faith in governmental technocrats is covered up, evaded, and uncomfortably required, in order for central bank NGDP targeting to even exist. I usually cringe whenever central planning oriented political strategists say they have faith in or support markets. It’s like a slave owner saying he supports freedom…for 90% of the population only. Noah is a Statist. Statists view monetary policy as competition to their reforming-society-through-stealing-and-forcing-at-point-of-a-gun dreams. Therefore, Noah is against monetary policy. I don’t know if Japan can actually control its inflation target. They have such a high public debt and they already pay around 8% of GDP on interest expense at 0% rates. The problem is if rates shifted to 2%, their interest expenses would dwarf their tax revenues. The problem is that a shift in their interest rates causes their public debt to explode. Add this in with all of the other structural problems(like declining population, less people in the workforce, no natural resources, etc), they’re basically stuck. The same thing actually happened in WW2. If you look at the Japanese inflation rate from 1945-1946, it went up around 9-fold, but their public debt went up around 30%(from 230%-260%). The numbers aren’t exact, but right around there. The problem is that the payments on debt increase exponentially as interest rates rise, so if the inflation target causes their interest rates to shift, they are indeed screwed and they may have to choose between very high inflation or default. It’s due to the nonlinearity between rising inflation and rising debt payments. The payments grow exponentially while tax revenues grow linearly. It just can’t be sustained mathematically. It’s very simple really. Do you think Japan will have hyperinflation or do you think they’ll default? I think hyperinflation is the only way because they have an aging population and they have to pay for their social security somehow. I just can’t see a way around it. The thing is, it’s not like Japan is the US where they’ll allow more immigrants. Japan is an extremely homogenized society that doesn’t like immigrants so they won’t have a way to pay for all of the old people. Suvy, they don’t need to pay exponentially increasing interest expenses. They can tack some of the interest expenses onto the debt so as to keep a constant debt/NGDP ratio. Then NGDP growth doesn’t matter. Central Banks weren’t hitting any inflation targets, it was the outcome of deliberate high (above 2%) unemployment and moderate output gaps which allow for the generic 2% inflation with moderate growth. Since the Great Recession the same banks mysteriously failed to hit their 2% targets, is it a sudden world-wide conspiracy? Answer: they can’t hit targets and the 2% inflation before wasn’t their doing. You’re forgetting about their demography. Japan has a declining population and the workforce population is decreasing. They have no legitimate way of reducing their deficit in the long run so they have to finance their deficits by printing money. They have increasing social security costs and they will necessarily have declining revenues because of a smaller workforce. I’m going to try and build a model of this, but it’s something they have no control over. They spend 25% of central government tax revenue on interest alone. A small increase in their interest causes their interest on their debt to dwarf their tax revenue. That’s checkmate, you’re done at that point. It doesn’t matter what you do, you have to choose between hyperinflation and default. A lot of the time, one can cause the other. It’s the same thing that Major Freedom was saying earlier. You add in that they have a declining population and workforce so they don’t have a way of funding a deficit. It’s simply unsustainable. I thought Noah got it very wrong with this comment. The LDP, which thrived in the 60s, 70s, and 80s, has always been a mercantilist outfit, weakening the currency to pump up exports, using the surplus from exports to support Japan’s corporatist social model in the so-called “two-tiered economy”. I thought Noah got it factually wrong with this comment. suvy, an increase in real rates (not accompanied by increased economic growth) would be a problem, but not a nominal increase. Whether they are paying 0% interest with 0% inflation or 2% interest with 2% inflation, doesn’t matter. (1) Noah doesn’t really get the full implications of your worldview, which would make Wittgenstein crap his pants. We don’t need to wait and see if there is a big showdown or not; Abe’s election already did whatever it was going to do. The results are mixed: Abe’s policy is looser than before, but not loose enough. Right? (2) To see the truly unexpected possibilities in the radical Sumnerian epistemology, the following holds: Suppose Ron Paul got elected promising a 100% backed gold dollar, the abolition of the IRS, and no further increase in the debt ceiling, ever. The next day after he’s elected, the market’s view of expected future price inflation averages minus 4% annually for 10 years. However, stock prices soar and real yields on Treasuries rise to 6%. In practice, we see NGDP rising 12% per year, for real GDP growth of 8% per year. In this scenario, Scott, you would say, “Thank God Ron Paul came in with his incredibly loose monetary policy,” right? * Oops sorry Scott I messed the numbers up. Make it NGDP growth of 6% and real GDP growth of 10%. This is a myth. It doesn’t matter if the interest expenses moved linearly, but they don’t when your debt is 25 times you revenue. It’s the same thing Major Freedom was saying. How do you think inflation went up 5 fold from 1945-1946, but the public debt went up. It’s a feedback mechanism and when your swaps move, your expenses move in a non-linear fashion. The revenues move linearly. For example, does doubling the interest rate on your mortgage from 5% to 10% double your monthly expenses? No, they move much, much higher. It’s the same thing with governments. That’s the risk of too much debt in the public sector(or in the private sector too for that matter, it just manifests itself differently). You simply lose control of the economy. That’s what too much debt does. In the private sector, it makes you very sensitive to shocks and very sensitive to shifts in the volatility of asset prices. In the public sector, it makes you lose control of monetary policy. I’m trying to find some sort of academic papers on this, but I’m not sure there has been much work done. It shouldn’t even be too difficult to model this. The tricky part would be how to account with the different time frames at which the debt is issued and the different interest rates for each of those time frames. You wouldn’t even have to make any assumptions on human behavior to do it. OhMy, They have continued to hit their 2% inflation targets, just as accurately after 2008 as before. 1) Obviously if Japan adopts a looser monetary policy and it results in a significant increase in RGDP growth, it changes everything…not just in Japan but the U.S. as well. 2) I think Noah’s political analysis is incorrect for a few reasons, a) the strength of the yen is obviously an issue but the reporting in the WSJ is not at all consistent with reporting in the Japanese press or with Abe’s actual comments which focus on growth.. not exports, b) the LDP got whooped in the previous election so there is still a very raw and fresh sensitivity to the need to actually deliver economic growth and not just make pronouncements, c) any student of history knows that in the pre-war period, Japan’s national slogan and modus operandi was “Rich Country. Strong Army.” Abe realizes that without strong economic growth that nay nationalistic aspirations are a pure pipe dream. 3) At the next BOJ meeting on Jan 20 (? ), they will agree to a 2% inflation target in exchange for Abe agreeing not to reform the BOJ law. 4) The real question is whether the BOJ will actually deliver on the inflation target. I think that depends on two things. The first is how quickly the new policy starts to produce results. If the results are quick, it makes it more difficult to backtrack. The second is who Abe appoints as Governor and Vice Governors in March (April?) As part of the deal to get the BoJ to agree to 2% at the Jan policy meeting, Abe might agree to appoint BOJ insiders which would be a big mistake IMHO. The BoJ Policy Board consists of 9 members… the Governor, the 2 Vice Governors and 6 outsiders (2 of whom already favor more aggressive policy). If Abe picks the right people it would create at least a 5-4 majority on the Board favoring aggressive policy and helping to insure the BOJ actually sticks to the inflation target. I really don’t understand who is advising Abe, but I find it hard to believe a politician would pick CB policy as his main campaign theme just as a vote getting device (what percentage of the voting public knows or cares about BOJ policy?) so I’m inclined to believe there is some real substance behind all of this. That said, Japanese bureaucracy always tends to do things in a half-assed way so there is a good chance that the BoJ will screw this up by not effectively communicating, not buying enough assets, or reversing policy at the first sign of improvement. I’d guess there is only a 50/50 chance we will get effective policy, but it is certainly worth watching. If everything was linear, this would be true. Things do not aggregate in a linear manner. My entire argument was based on nonlinearity. When you look at a nation that borrows on many different time scales, the whole shift in their yield curve matters, it doesn’t just shift it upward, it shifts the the shape of the curve. If the curve becomes more convex, as it would be basically guaranteed; would cause their borrowing costs to spike. They would no longer be able to roll over their debts without hyperinflation. The markets are a complex, dynamic, and extremely nonlinear which makes everything extremely sensitive to the initial conditions. A high level of debt combined with the structural problems of Japan and any sort of shift in their yield curves blows them up. It cannot work. The problem is that when you change one thing, it changes a whole host of other things. There are second, third, etc order effects involved. That makes everything extremely sensitive to the initial conditions. The same thing already happened to Japan after World War II. For example, suppose I have a $1000 loan that matures in 5 years with 3% monthly interest and one with 6% monthly interest. The monthly payment for the first loan is ((1.03)^5*1000)/5=200*1.03^5=231.85. The monthly payment for the second loan is 267.65. For an interest rate of 9%, the monthly payments are 307.72. For an interest rate of 12%, the monthly payments are 352.47. Do you see how it blows up exponentially? It’s even worse for governments because the yield curves don’t just shift up, but the shape of the curves themselves changes. In this case, the curves would become much more convex, making the effect I explained earlier much much more intense. When you already spend 25% of your government revenue on your debt service at 0% interest rates and you shift inflation from -1% to 2-3%, you’re finished. The math simply does not work out. It really is that simple. Just look at the yield curves, look at the maturity of their debts, look at the distribution of the maturity of their debt, and then shift interest rates up 200 basis points. Then put it into MatLab or R and see what you get. Now, their revenue will increase, but it will do so in a linear fashion. In other words, the revenues cannot keep up with the spiraling costs. I think this strikes at the root of the problem of central bank independence. The leaders of our country should NEVER have to negotiate with our own central bank. It should be serving us, not itself. Suvy, it’s not a myth. Yes, when NGDP growth and interest rates increase, then keeping the debt unchanged in nominal terms requires making interest payments which increase exponentially with rates: but that’s because you’re _paying down_ an exponentially increasing portion of the debt in NGDP-relative terms. It’s only when interest rates move independently of NGDP that problems can arise. dtoh, Great comment. I’m taking a wait and see attitude to Abe. The market reaction so far is consistent with your analysis. Suvy, I’d expect NGDP growth to rise faster than nominal interest rates of Japanese government debt. I think you really need to look at the numbers more closely to draw any conclusions. Assuming the higher inflation also produces higher N/R GDP growth, then in addition to the drop in real value of principal that needs to be repaid, you get a lot of other benefits including a spike a corporate tax receipts, reduction in unemployment payments, real drop in health care reimbursements, pension payments, ag subsidies, etc. Also depending on the scale of BOJ OMP, you’ve also extinguished a significant portion of the debt. Also it’s not at all clear how much you need to raise nominal rates in order to hit the 2% inflation target. I’m sure there are some economists employed by the banks that have done pretty careful studies on this so it would be interesting to see them. My guess is that you might get some short term deterioration in the government balance sheet, but that it would be fairly modest. People are talking about how Japan can have real growth? HOW! This country has so many structural problems. It’s not just their level of debt, it’s also that they have a declining population and an aging population. Their workforce is decreasing at a rapid rate. Unless they stop the social security benefits, they have more and more people exiting the workforce. They have less and less people working while more and more people are taking in benefits. That means they have larger and larger budget deficits. They’re already monetizing around 60% of their deficits in a country where they sell more adult diapers than kids diapers. You can’t solve these problems with any sort of monetary policy response. These are structural problems that will destroy the living standards of the country. NGDP targeting does nothing to fix these problems. When you have a fertility rate of 1.1 and you have the population demography that Japan has with the highest life expectancy in the world and their public debt, they are screwed. It just doesn’t add up. Every single social safety net scheme is a Ponzi scheme and that Ponzi scheme can’t be sustained in a falling population with a falling population. How can they keep taking care of a larger and larger share of their population with a smaller and smaller share of their population. It doesn’t make sense. It is impossible. These are problems that haven’t been addressed for 25 years and now the day of reckoning is almost here. They have no chance. No monetary policy response can give them growth. Economic growth doesn’t come from policy, it comes from the accumulation of capital. Japan has completely destroyed their capital base. This means they have absolutely no chance. They have too many structural problems. They don’t have a monetary policy problem. THEY HAVE A STRUCTURAL PROBLEM. They’re running a Ponzi scheme. This is Bernie Madoff on a large, large scale. You do not create growth by taking wealth from the smaller and smaller part of your working population and giving it to the larger and larger part of your population sitting around. It’s not sustainable. You do not create economic growth by printing money. You create growth by facilitating an increase in the capital stock. The last time Japan had such a high debt level, they had hyperinflation. Either this or default is the only solution to countries with these kinds of structural problems. We’re nearing the end of a 70-80 year debt cycle in Japan. When you look through history over any time span longer than 50 years, you see this. 50% of the world restructured their debts before World War II. That started a new cycle. That cycle is now coming to an end. Suvy, you don’t think a looser monetary policy will have an effect? OK great, I too would describe my scenario above as a supply-side revolution, not loose monetary policy. But I had thought *by definition* you said tight money occurred when NGDP growth fell below trend. Is that not correct? Not to say Japan does not have structural problems… they do, but a lot of their stagnation is also caused by dysfunctional monetary policy. IMHO, Japan can probably get to 3% RGDP growth by fixing monetary policy. If they fixed their structural problems they could easily get consistent 7% to 8% real growth. As for the demographic issues, these are a result of no economic growth…. not the cause. Again, I’m not disagreeing with you on the structural issues… I could write several tomes on the issue, but monetary policy is an easy fix and will produce positive results quickly. I also agree you increase growth by facilitating an increase in the capital stock….but one of they ways to do this by boosting real prices of financial assets (i.e. lowering expected real risk adjusted returns), i.e. expansionary monetary policy. Suvy, new inflation in Japan will not affect the interest paid on existing debt. You imply that all Japan debt is adjustable rate, but it is fixed. Japan can have real growth through productivity gains and/or increased workforce participation. It doesn’t necessarily require natural resources. Facebook.com has lots of value, but doesn’t consume much iron. Do you think Japan will have hyperinflation or do you think they’ll default? I think hyperinflation is the only way because they have an aging population and they have to pay for their social security somehow. I just can’t see a way around it. “If with that much debt a central bank tries to inflate its way out of the problem, and this moves the swaps curves or debt costs, then expenses grow exponentially while revenues grow linearly. Default and hyperinflation are going to co-exist in Japan. It’s not a matter of if, but when. People are talking about how Japan can have real growth? HOW! This country has so many structural problems. 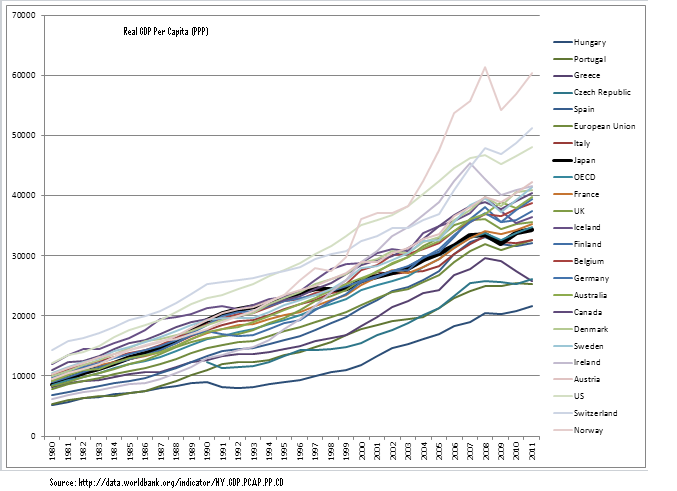 If you go by Real GDP per capita (PPP), Japan has had steady real growth during the so-called “lost decades”. Mark Thoma reports that David Altig (Atlanta Fed) is still skeptical about NGDP level targeting. His theoretical objections seem to be similar to Thoma’s, i.e. that no well-known macro model has NGDPLT as the optimal policy. I don’t really understand his practical objections, but they have something to do with the potential/RGDP path being too uncertain, which would cause instability in the nominal anchor, or something like that. Thoughts? Don, explain to me how a country like Japan with their population demography can have increased workforce participation? They have no choice but to keep running larger structural deficits because more people are leaving than entering. They’re sucking away resources from productive resources into unproductive resources. It’s impossible. Japan cannot have 3 percent real GDP growth period. We live in a world with finite resources. Infinite growth isn’t possible without the development of capital. It’s impossible. 3 percent GDP growth won’t happen without growth in capital. The US isn’t getting 3% GDP growth right now, how can Japan create 3% GDP growth with their structural issues. It’s this simple, there are 3 inputs in an economy: land, labor, and capital. The only way growth happens is because of the increase in the stock of capital. How can Japan increase capital when it has a smaller and smaller productive part of their population every year and it takes away more and more resources from its productive sectors to provide for the unproductive. For Japan, growth is impossible unless they stop subsidizing the unproductive sectors by taking from the productive when the unproductive is increasing and the productive is decreasing in proportion to their population. The structural is far more important for growth than monetary policy is. Printing money does not facilitate the growth of capital–which is what really matters. Just because Japan had barely any growth in the lost decade doesn’t mean they’ll have growth in the future. Growth was negative last year and will stay that way for a while until they fix their structural problems. If the Bank of Japan practices serious QE, that will pay down their debt. If they can generate some moderate inflation, say 5 percent, that will also “pay down” the debt. If they run a balanced budget, they could pay off perhaps one-half of the debt in a decade or so…. As for their aging workforce, that is true. But it is also true that less jobs are physically demanding these days. People can work until they are 70, and the japanese are a healthy bunch. They also have a health system that does not keep carcasses alive past the expiration date. Long-term, they could encourage people to have babies. The tax code could do this. Japan already imports labor, although carefully. Girls in tuna factories and housed there too etc. They just need to expand these operations. Plenty of cheap labor in SE Asia and the Philippines. But the big thing is QE. They should consider paying down the national debt by printing lots of money aggressively for the next five to 10 years. Scott – what led to the currency production explosion of 1939-1941? Do you feel that it was a symptom or a generator of NGDP recovery? Just because Japan had barely any growth in the lost decade doesn’t mean they’ll have growth in the future. According to GDP per capita (PPP), if Japan had “barely any growth”, then what of the many other, more inflationary economies that had less growth? Why aren’t you talking about the “lost decades” of Hungary, Portugal, Greece, Czech Republic, Spain, Italy, or the EU? Growth was negative last year and will stay that way for a while until they fix their structural problems. More inflation won’t do it. If the Bank of Japan practices serious QE, that will pay down their debt. This is not correct. You are fallaciously presuming that interest rates will stay the same with higher inflation. But if the swaps curve and interest costs rise by 200-300 bps because of the inflation, then the Japanese treasury’s expenses will exceed their revenues. You people who are recklessly clamoring for more inflation in Japan are seriously misguided as to Japan’s situation. Don’t you know that their debt is so high relative to their tax revenues that higher inflation will increase expenses exponentially while revenues will increase only linearly? You work with crude, simple models that are taught in classrooms that abstract away from real world situations too much to be non-destructive, let alone of any practical use. c) decrease real yields (i.e. increase real financial asset prices), in which case you get increased exchange of financial asset for real goods and services (both investment and consumption). This is trivial. There aren’t any other possibilities! It hasn’t yet been a full decade for these countries, but it will be. I’m agreeing with you on this. Since we know of Japan’s population demography, I think it’s a safe assumption to say that the real output of Japan won’t increase any time soon. Therefore, Y(t) is a monotonically decreasing function. In other words, Y(0)>=Y(t) for all t>0. So let’s say that Japan monetizes it’s entire deficit every year. I think it’s safe to say that due to Japan’s structural issues that the deficit is going to keep increasing. Therefore, we know that not only is dB/dt>0, but if the deficit is increasing and we monetize the entire deficit, d2B/dt2>0. The credit money of japan has gone up a little bit, but it’s negligible so we’ll assume it has stayed the same. Therefore, dC/dt=0. We also know that M(t)=B(t)+C(t), so we can show that dM/dt=dB/dt+dC/dt=dB/dt. Since dB/dt>0, dM/dt>0 and similarly, we can show d2M/dt2>0. So basically, in order to do this, you have to increase the money supply at not just an increasing rate, but at an accelerating rate too. Let’s see the impact that it would have on prices. We know that since Y(t) is monotonically decreasing, dY/dt=V(t)*dM/dt+M(t)*dV/dt since dY/dt0 and d2M/dt2>0. So that means the only way that we don’t get accelerating prices at an accelerating rate is if the velocity of money doesn’t keep dropping. Notice that we haven’t even factored in interest rates yet. Not only does an increase in interest rates increase the debt service payments exponentially, but increases in inflation do increase tax revenues. However, inflation increases tax revenues linearly, so that adds to the rate at which the already increasing budget deficit will keep increasing. Also remember that i=r+dP/dt. Since we have shown that dP/dt>0 after some point due to their increasing budget deficits, i starts increasing at a faster and faster rate. Since their budget deficits increase. The revenues only increase linearly while the expenses move more than linearly due to the change it has on the rate of interest and their debt service costs move exponentially with the rate of interest. This is simple, basic math to see. I have just shown that Japan will have to have hyperinflation due to their structural problem. This assumption is based on the idea that there are 3 inputs:land, labor, and capital. The size of their workforce is falling and has been for some time. They’ve also basically destroyed their capital base and with their level of debt, it’ll be very difficult(I think impossible) for them to increase their capital base. Therefore, they can’t increase Y. This assumption comes from the fact that the size of their workforce is falling and those receiving support from that group is increasing. Their social security payments are increasing while their workforce is decreasing. That means they will have increasing deficits because they have to take care of more and more people while less and less people work. That’s not a sustainable policy for their budget. 3. They monetize their full budget deficit every year. This is completely variable. However, even if they did monetize more than their deficit, their deficit will keep increasing as far as the eye can see due to their structural problems. So at some point, they will be forced to monetize debt at an increasing accelerating rate. Basically, hyperinflation in Japan is inevitable unless they default. I also think Major Freedom is right in the sense that they could still have hyperinflation and default. My basic idea boils down to this: their structural problems will destroy their country. It’s simply not sustainable. When you model everything dynamically, it becomes blatantly obvious to see. I’m going to try to develop this model a little bit more. Put in a few other things in there. Then I might run some test runs on MatLab, get a few phase portraits and things like that. It might help me understand these types of systems a lot more. Does anyone know where I can find other dynamic types of economic models? The only economist I’ve ever seen use these things is Steve Keen. I don’t think equilibrium models are really of very much use as equilibrium itself is a transitory state. I also found this video for financial markets and about how this kind of stuff was being used to model stock markets. I think you make a valid point about the workforce, but there’s an important thing to remember with Japan. They have the longest life expectancy in the world. They also will have a declining population. I don’t think Japan can afford massive asset purchases. I don’t think they have any control over where they go. As for running a balanced budget, in a country where you have so many people that need social security, what is there to cut. If you cut anything, you’re going to get voted out. I think raising taxes won’t help much because the economy is already in negative growth. I don’t know how much tax revenue increases in tax rates can bring. What is “to afford” about QE? The BoJ prints its own money. They can afford whatever they like. It is called monetizing the debt. They can buy Japanese Treasuries, and reduce Japan’s debt. Inflation will also lessen the relative value of debt outstanding. The BoJ can afford whatever it wants. They can raise the retirement age. BTW, Milton Friedman dealt with many of these issues in a piece he wrote for the Hoover people, Stanford. He advocated Japan print money to the moon, basically. Japan can import some labor, and encourage family formation through its tax code. I suspect the 20-year perma-rcession is putting many young people off on having babies, and that is reversible. And having large or small families as a fashion can change too–in Israel, large families are in again. The question is not can Japan do better—-but will it? If Japan is already producing at capacity, then a higher target inflation rate will just result in higher inflation (and higher nominal wage growth.) It won’t help anything. If Japan is producing below potential, and more spending on output is how the Japanese central bank raises inflation, then real output will grow fast for a short period of time, and then perhaps return to its previous growth rate. The inflation rate and nominal wage growth will be higher. However, real income will be on a higher growth path, and everyone will be better off than they would have been. It is important to think about levels as well as growth rates. Follow-up question: is it optimal for emerging markets to have faster inflation than developed countries? I’m trying to think of this question in terms of RGDP and NGDP. 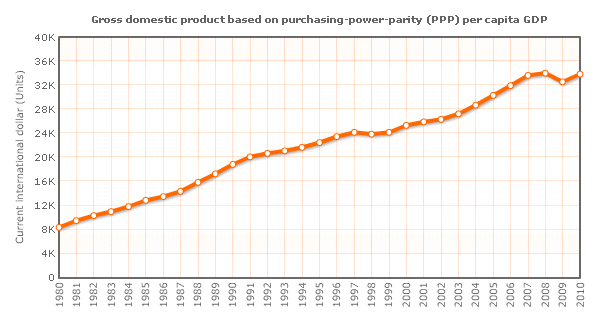 Imagine that over the long-run, China is expected to have RGDP growth of 6%. Does that mean that they should try to have an NGDP growth rate of 10%? What are the primary reasons why China should allow faster inflation than developed countries? Japan is already monetizing 56% of their deficit. I made the assumption in the model that they were monetizing their entire deficit. It’s too late. You can have babies now, but they won’t be working until at least 15 years from now. It won’t help them stave off default/hyperinflation. I agree though, if these reforms were done in the late 1990s, I don’t think they’d be where they are. The problem is that it is too late. They’re also a very homogenized society that doesn’t have immigrants. This country isn’t like the US in the sense that they’re not as welcome to immigrants. As for reforming their social security by increasing the retirement age, I don’t think it’s gonna happen. The guy that does that is going to get voted out, so no one is going to do that. They can’t because the deficits are getting progressively larger. I explain this in the model. Eventually, the rate of inflation will explode due to their ever increasing deficits. It’s too late now. I think had they have done this in 1990, I agree with you. That’s the problem when your debt gets 25 times your revenue, as Major Freedom points out. We(the US) need to print more money now. I think Japan is a really good learning tool for other countries stuck in deleveragings. 1. Print money early, not late. It won’t cause inflation because the private sector isn’t creating money. 2. Deal with your structural problems don’t just kick the can down the road. 3. Don’t allow your population and especially your workforce population to fall. You get used to looking at a lot of data when you spend your career in accounting. There’s a big difference between the roc’s for inflation vs. roc’s in nominal-gDp. That all important difference is the roc in real-output. If you miss inflation targets by a little, you will miss real-output by some multiple (that’s what the data says). All the Fed can do is minimize the flucuations. The easiest way (& less political), is to control the largest variable. What do you mean it hasn’t been a “full decade” yet? Did something magical happen less than 10 years ago in those countries? You seem to be cherry picking an arbitrary moment in time and set that at ground zero to suit your purposes. The data for all of the countries I listed start and end on the same years. There is a 20 decade period for all the countries listed, not just Japan. Your analysis is wrong in so many ways, it’s hard to know where to start. 1. You have no idea what will happen to nominal rates if the BOJ is more accomodative. 2. Your assumption about no real growth is completely off. You ignore the labor force participation rate. Your statement that Japan has destroyed its capital base and can’t increase it is non-nonsensical. You ignore increases in labor productivity that are not based on increased capital. 3. You have no idea what higher nominal output will do to tax revenues. 4. You ignore the fact that Japan can cut government spending. 5. You ignore the fact that Japan can raise taxes. Your whole argument is circular… you assume no growth and increasing budget deficits to prove what?… no growth and increasing budget deficits? Well duh. It’s nonlinear. It’s highly sensitive to the initial conditions and you clearly don’t understand my model. It starts to blow up very, very quickly due to the feedback. It’s very common behavior in nonlinear systems. I developed an actual, nonlinear, dynamic model(not the DSGE nonsense that’s currently used). That’s the behavior of dynamic models. I’m not trying to mathematically predict what interest rates will be, I’m using models to understand the qualitative behavior of the system. This is very common practice in fields of chaos theory and complexity theory. Please tell me how it’s possible for a country that has a declining workforce where they have to support more people that aren’t working with less people that are working to facilitate growth in productivity and capital. Even if they do, it’s not like they’re going to be having 50% productivity growth or anything like that. Productivity growth comes from growth in capital, whether that’s someone inventing a machine, building a factory, etc. What Japan has is a Ponzi scheme. To keep it running, they need more people entering than leaving. With a declining population, it’s not sustainable. Also, history is on my side here. When debts get 25-30 times your revenue, that’s what happens. There’s no other way. There just isn’t. Rogoff and Reinhart basically have a whole book on 800 years of data with primarily sovereign debt, that’s what’s always happened. The name of the book is This Time is Different: 800 Years of Financial Folly. I’m sorry, but this time is not different; it’s the exact same. Again, tax revenues will increase in a linear fashion. They can’t increase exponentially. With a small rise interest rates, the costs of debt service increase exponentially. Here’s a rule of math, exponential growth>linear growth. It has to be because the derivative of one keeps increasing while the derivative of the other is constant. The question isn’t whether they can, the question is whether they will. The guy who does this won’t be in office much longer. If they do this, they’ll have a lot more issues because the only thing that’s keeping demand decently high is government spending. They could print money, but we already know the consequences of that. There’s feedback in the system and due to their high level of debt, a small change puts them over the threshold level of blowing up. It simply cannot be sustained. Again, they’re running a Ponzi scheme. With a declining population, the Ponzi scheme can’t be sustained. You’re assuming increased tax rates will bring up tax revenues. There’s a nonlinearity here, especially in a weak economy. Increased taxes taxes away resources from an already weak economy and for every percentage increase in tax rates, you get less and less of an increase in revenue. They’re starting to have falling output, so we’ll assume that Y is constant so that dY/dt=0(we’ll assume no growth rather than falling growth due to their structural problems). I started out with this assumption. dM/dt is always increasing because of their structural problems. So far, the velocity of money in Japan has been falling, but I don’t know how much lower it can go. If prices start to increase, velocity will as well. So we have M increasing at a faster and faster rate, Y is constant so 1/Y is constant. dM/dt>0 and the velocity of money is always bigger than zero. Therefore, dP/dt isn’t just positive, but it increases at an increasing rate. As this happens, interest rate goes up. That will cause expenditures to increase exponentially. When you print money and increase nominal income, that will increase linearly. A rule of math: exponential growth>linear growth after a certain threshold. From their structural problems, that threshold will be reached. I can’t predict when this will happen. That’s impossible, I do know that it will. Again, looking at any sort of historical data beyond 80 years will show this. This is a part of a debt supercycle that happen 1 every 60-100 years. We’re going through another one. It’s consistent with the data. Those are the countries you were talking about. Spain had a lot of growth in 2005 from it’s real estate bubble. So did Portugal and I think Greece too. I’m sorry dude, but GDP maxed out at 2008. It has not yet been a decade. It will be, but it hasn’t been one yet. For people that are having difficulty understanding the compounding effects and the nonlinearity between increases in inflation creating and increase in interest rates and its impact on revenues and expenses. Let’s start as an individual. Say I have an income I have a level of debt 25 times my income. I spend 25% of my income on debt service alone with my interest rate at 0%. If inflation goes up by 2%, my wage increases by say 5%(just to show the impact, chances are my wages won’t increase by that much). Now, when my interest rates increase by 2%, my costs multiply by more than 3 or 4 fold(they’ll go up by much, much more than that) while my income increases by 5%. So my expenses go up by 400% minimum(I’m being extremely conservative) while my income goes up by 5%. I blow up. The same thing is going to happen to Japan. There is a nonlinearity involved that causes the situation to get out of hand very quickly. Now, you could raise revenues and cut spending, but at a macro level, that would cause demand to collapse causing falling incomes. In other words, Japan is screwed big time. It just doesn’t add up. They have absolutely no chance. You are saying the exact same thing I have been saying. Bob, The monetary policy may be loose, if NGDP is above trend. But that wasn’t the question you asked me. You need to be more specific, and spend less time trying to score debating points. When you are sloppy I can always dodge the “real question.” If you have a question, ask me directly. I would describe that as a supply-side revolution accompanied by somewhat looser money. Why would you think otherwise? anon, If you want a model where NGDP targeting is optimal, it’s easy to create one. I don’t happen to think NGDPLT is optimal, so I agree with Thoma in that sense. But I’d say it’s far better than what we have now. TravisV, It’s not obvious to me that emerging countries should have faster inflation–of course I oppose inflation targets anyway. So you have no position on this? Really? Why don’t we ever see you criticizing the rapid rate of inflation in China? TravisV, China’s inflation rate in 2012 was about 2.7%. A slightly lower trend rate would be desirable, but China has MUCH more important issues to worry about. The cost of excess inflation in China is trivial. Much more important is stable NGDP growth, preferably a a slightly lower rate than recently. It depends on the debtor. If I have a moderate income and moderate debts that I am slowly paying down, an increase in inflation will likely make it easier for me to pay down my debts. The notional quantity of the debt is fixed, I may get a cost of living adjustment to may wage, and my debt service falls relative to my income. But, if I have large debts relative to my income, I pay the interest only, and I run on the hope that I will be able to roll over my debt at some future date at a rate that is in the neigborhood of my current rate. An increase in inflation may lower the my debts in real terms, but it will increase my debt service costs faster than itit reduces my real debts. With a sustained increase in inflation, In a short amount of time my debt in real terms will be greater than it would have been without the increase in inflation, and I will no longer be able to afford the interest expenses. This is the situation that Japan faces. If I am a truly chronic debtor, who is borowing extensively, and is still spending more than I take in, and infact borrows money to make the payments on my existing debts, then an increase in iflation starts a death spiral. My costs increase faster than my income and my debt service rises at the same time. This is what the United States faces. If a government want to use inflation to escape its debts, it must devalue in one swift move, and then hope to convice the world that this was a one time move, there will not be a second devaluation and iflation will be controled. Oh, the monetarists I’m talking about include my PhD advisor (Miles K) and some other people he knows in academia. I just linked to Yglesias’ post because it was convenient, and Miles hadn’t written a post about Abe specifically. Noah, Thanks for the info.